Dana Williams-Johnson, Founder of The Art of Accessories. Click here to watch the Vimeo video that features the panel introducing themselves. 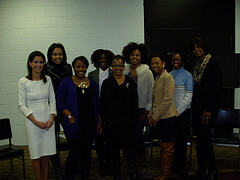 Check out the event’s photos on Flickr. 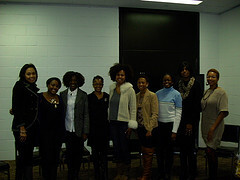 Ananda Leeke, founder of Digital Sisterhood Month, organized and moderated the panel discussion. Many thanks to Xina Eiland for serving as the event videographer, Sharon Malachi for serving as the event photographer, and Glory Edim’s mother Ms. Henrietta for making “Digital Sisterhood” cupcakes (they were yummy) for the ladies! Check out the videos from the event below. 9. Dana Williams-Johnson, Founder of The Art of Accessories. Many thanks to Xina Eiland for serving as the event videographer, Sharon Malachi for serving as the event photographer, and Glory Edim’s mother Ms. Henrietta for making “Digital Sisterhood” cupcakes (they were yummy) for the ladies! Click here to listen to my audio blog recap of the event. Click here to watch a video (21 minutes) that introduces the panelists and their blogging passions.